Welcome to 'The Retreat' Villa a wonderful high spec villa, with South/South East facing pool and lakefront location offering you a luxurious vacation home for your visit to Orlando. 'The Retreat' is located in a cul-de-sac with no through traffic within the quiet gated community of Sunset Lakes, just 4 miles from Disney making it one of the closest rental villas available to all of the Orlando theme parks, shopping malls and many golf courses. After a long day enjoying all that Orlando has to offer, relax and unwind around the private pool enjoying the beautiful views of Sunset Lakes and enjoy the evening entertainment of the spectacular Disney fireworks lighting up the sky. Our beautiful 4 bedroom/3.5 bathroom villa (over 2600 sq ft/over 3500 sq ft including the pool area) has recently been upgraded to a high standard, amongst the many upgrades are flat screen cable TV/DVD combo’s in all bedrooms, a large 60” flat screen cable TV and state of the art iPod dock/radio/CD player in the family room, iPod docks in all bedrooms and a fantastic outdoor entertainment area including fridge, sink, grill and cable TV. The villa’s private pool overlooks the beautiful Sunset Lake, the pool is not overlooked from either side offering you the highest level of privacy. The pool can be illuminated with bright LED pool lighting. Make the most of your time at 'The Retreat' villa and enjoy the pool all day and night with our unique poolside outdoor entertainment area with grill, sink, and refrigerator and cable flatscreen TV. We are also pleased to be able to offer a smaller shallow pool suitable for younger children, this adjoins the main pool. The decking around the pool has ample furniture for all your needs including sun loungers, a high top table and bar stools aswell as a breakfast table and seating. 'The Retreat' benefits from two excellent sized master suites, each master suite has a King size bed, flatscreen TV/DVD combo with 100s of cable channels including movies and sports, iPod docks, oval bath tub, walk in shower, his and her sinks, WC and large walk-in closets. Both master suites have fantastic views overlooking Sunset Lake. Two Disney themed twin rooms (Micky Mouse/Minnie Mouse themes), both of which have twin beds, iPod docks, flatscreen TV/DVD combo with cable including kids entertainment channels and large closets. The main family room has 3 large comfortable sofas positioned around a fantastic 60inch flatscreen smart TV/DVD combo with cable channels, also in the family room is a state of the art iPod dock/radio/CD player providing all the entertainment you could need. A separate living area which we call the lounge room offers two further large sofa’s, one of which can be converted into a double sofa bed (bedding provided), and a dining room with seating for six. The open plan large kitchen and breakfast area overlooks the family room and also has a dining table with seating for six. The kitchen is fully equipped with a large fridge/freezer with ice-maker and water dispenser, microwave oven, electric oven with ceramic hob, dishwasher, food disposal and telephone (free USA wide calls). Each room has in addition to full air conditioning, an overhead ceiling fan. This includes the pool deck keeping you cool in the fantastic Florida sun. For your enjoyment we have provided an extensive DVD selection and book library at ‘The Retreat’. Sunset Lakes is a gated community with community pool and children's play area just two minutes walk away from ‘The Retreat’. In addition just 30seconds walk from the villa is a beautiful fishing dock available for your use (fishing rods provided). There are over 20 golf courses within a very short distance from Sunset Lakes including Orange Lake, Mystic Dunes, Celebration and Falcons Fire. Feel free to visit local golf shops/outlets who are more than happy to offer advice on course condition and normally provide vouchers for cheaper green fee’s. The Formosa Gardens shopping Plaza is about one mile from the house. It boasts several restaurants including Outback Steakhouse, Red Lobster, Buffalo Wild Wings, Chinese, Italian and a new Sushi Bar. There is also crazy golf course. Hi, we are Brian & Carol ,Tony & Karen, Carly & Steven. We bought this gorgeous property as our home in Florida. We are completely thrilled and over the moon to own such a dream property, we renovated the house when we purchased it and continue to upgrade 'The Retreat', our aim is to make 'The Retreat' the perfect home away from home for ourselves and our guests. From the moment we saw this villa we knew it was the one, with the magnificent Sunset Lake at the rear and the spacious plot 'The Retreat' occupies. 'The Retreat' has unrivalled privacy rarely found in the rental areas surrounding Disney. Sunset Lakes close proximity to Disney means you can spend more time enjoying the villa and the parks and less time travelling. 'The Retreat' Villa has unparalled unobstructed panoramic views of Sunset Lake and complete privacy from our neighbours, at 'The Retreat' you will truly be able to relax in what we believe is paradise. Being on the lake and also so near the fishing pier, playground and community pool offers added convenience for our guests. 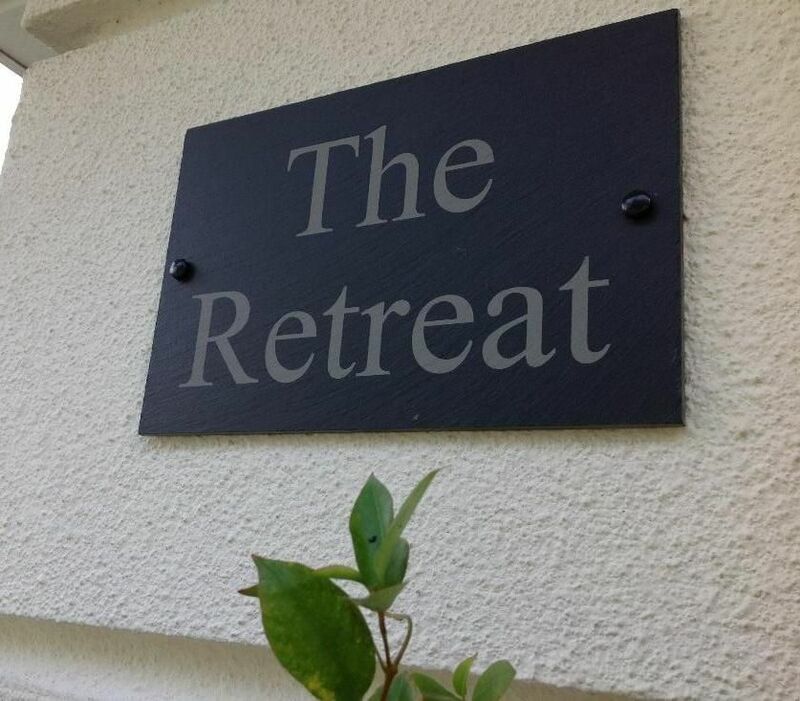 We believe that once you have stayed at 'The Retreat' you will most definately be wanting to return. En-Suite master bathrooms have a bath, walk in shower, his and hers sinks, WC and walk in closets. Bathroom 3 is on the 1st floor and is Disney themed with a bath/shower, WC and sink. Bathroom 4 is on the ground floor and consists of WC and sink. The Retreat does have a garage which has been converted into a games room for your enjoyment. Large open plan Family Room which has three large sofas positioned around a 60inch flatscreen TV/DVD with cable channels and a state of the art iPod dock/radio/CD player. All dishes and utensils are provided with enough for 10 occupants, we also provide plastic cutlery/plates/cups and glassware to use safely around the pool. We have 2 dining tables both of which can seat 6 people. Cable with 100s of channels including sports/kids and music, to all TV's except the one in the games room which is linked to a PlayStation 2. DVD players built in to all TVs except the one in the outdoor entertainment area. A small selection of board games are at The Retreat for your enjoyment. Small selection of CDs are at The Retreat for your enjoyment. Pool table located in the Games Room. Selection of video games for PlayStation 2 in games room. Large lanai covering the deck and pool to stop the bugs ruining your fun. Extended deck which is covered to stop bugs and houses the pools, furniture and outdoor entertainment area (grill, sink, fridge and flatscreen cable TV). The ground floor is wheelchair accesible although the only way to access the 2nd floor is via staircase. Private covered pool area consisting of a large main pool and a small/shallow pool suitable for younger children. Sunset Lakes has a communal pool and childrens play area a short walk from The Retreat. We had a great week. Location was perfect for Disney and shopping. Nice quiet safe neighborhood. an excellent home, very comfortable. Uma casa muito agradável e bem localizada, muito conforto, exatamente como informado no site. A única observação é que acabamos contratando o aquecimento da piscina, numa época que é impossível usa-la, muito frio. Recomendo. It was a perfect location, no tolls pst the airport to the parks (Disney, SeaWorld, Universal). Beds weren’t the most comfortable, maybe an understatement. Bathrooms were clean but not updated. Kitchen was nice, pool is pretty. Big tv and garage is full of things to occupy kids (of a little older age). Location is near many restaurants and target. Of all the Florida villa's we have stayed in over the last 8 years this was by far the best, you will not be disappointed. Fantastic location on sunset lakes, great villa. For the past twenty years, I have been staying in Florida using different villas across different locations. I have stayed on Sunset lakes Five times in Five different villas and this with hand on heart this,has been the best. The view over the lake makes your mornings so much nicer. All the small details have thought off. We stayed at the Retreat from mid to late August, we had previously stayed round the same area in 2012 and 2015, back then we went pass Sunset Lakes pretty much every day on our way to the parks and earmarked it for our next stay. We originally booked with Brian back in January 2017 as we knew his villa got booked up early, entering Sunset Lakes for the first time and driving up to the villa was a great feeling it was beautifully lit and was very welcoming. We dropped our bags and had a good look around, it was exactly as the photos, clean with a huge amount of space. During our holiday we made great use of the pool and games room, the kitchen was brilliantly equipped there were loads of pool towels infact the place was perfect! We have been to Florida many times and stayed at plenty of villas, this has to be the best for us. The location is key, it's close to many restaurants and Disney parks are 15/20 mins away, the sunrise in the morning is spectacular over the lake. Brian was excellent to deal with very helpful. Would we stay here again? 100% yes! The Retreat villa occupies possibly the best position on Sunset Lakes for proximity to community pool and play area, fishing deck but also quiet cul de sac position with no through traffic. The Retreat has beautiful views of Sunset Lake and an early wake up is rewarded with a views of a breathtaking sunrise over Sunset Lake.